Twitter is a powerful social media and has become a common tool for success at live events. Organizers, sponsors and attendees alike can garner more followers and engagement during live events than any other type of campaign. Live-tweeting is similar to note-taking, or the telephone game, passing on important tidbits of information or news to your followers around the world. It's immediate, it's interactive, and in 140 characters or less + photos you can expand your influence, or a brand's influence, tremendously. Make a list of brands and attendees for the event so that it is easy for others to find and follow as well. Make sure you share the list with your followers and even on other social media, inviting them to cross over to Twitter and follow the event. Follow the event host, brands and other attendees. This is a no-brainer. Business is built on relationships, so start connecting with others around this common interest early. Promote the brands who have invested in the event. Brands are looking for exposure, but also often looking for more promotional partners. Make yourself visible to them by interacting from the start and being appreciative of their investment. Use the event hashtag. Most events will have a hashtag. Use it for everything related to the event. This is the easiest way to be seen by all involved, and help the event build their exposure as well. Let your followers know you will be tweeting from the event. Let them know if you will be tweeting more than normal, so they don't think your site has been hacked. Build it up to them and encourage them to follow along, even if they will not be there in person. It is possible to interact so much on Twitter that others will wonder where you are and how did they miss meeting you. Position yourself in the sessions to be able to take great “tweetable” photos. A picture is still worth 1000 words, so when you're limited to 140 characters, a photo goes a long way. Be sure to get a good seat, so that your photos will be the ones everyone wants to retweet. Always try to tag those in the photos as well. Take photos with speakers and other attendees and tweet it to them. Twitter fame is enviable. If you post a photo with someone and tag them, they will inevitably retweet to their followers. Retweet and interact with others who are tweeting from the event. Twitter is a conversation. Short and to the point, yes, but a conversation none the less. Interact with others who are tweeting about the event and you will stand out. Thank the brands who have sponsored during and after the event. Everyone likes to be thanked. Brands sponsor for exposure. They want to reach more people and sell more stuff. They are counting on the attendees of the event to help them do that. Be mindful to use their handles and hashtags in your tweets. Thank them for the impact their investment in the event has made on you, your business, and your followers. Congratulate the winners of giveaways and prizes. Congratulations those who win or get prizes or make special accomplishments increases your visibility, likability and improves the whole mood of the social community surrounding the event. Don't be jealous or stingy. Use those powerful tweets to congratulate and praise. Keep complaints to a minimum. Complaining can turn a bright day dark fast. Don't be the rain at the party. Collect the best tweets and create a summary blog post about the event. This is a great way to share a recap with your followers. To learn how to embed tweets in a post, visit this guide. Keep interacting with your twitter audience and brands. You will inevitably gain followers during a live event. Keep engaging with them even after the event. Consistency is huge in gaining a following. Evaluate your tweet engagement during the event to discover which types of tweets or information created more engagement with your followers. Did you followers prefer quotes? photos? questions? etc…Noting what type of tweet they engaged with best will help you maximize your next live-tweeting opportunity. What would you add to this list? 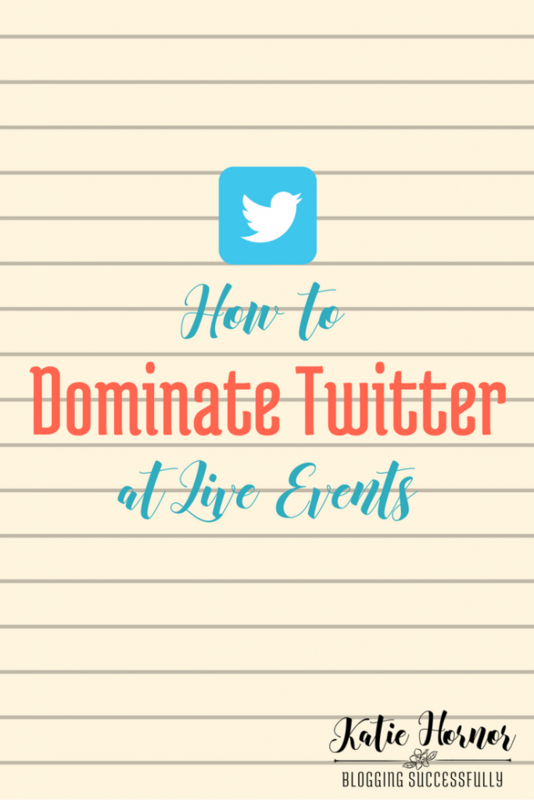 Do you have other tips that help you dominate Twitter at live events? I'd love to hear them. Follow me on Twitter @Katie_Hornor for more great blogging and business tips! Great tips before a huge event here in DFW. So glad you found it helpful Amber! Enjoy your event!